I first heard about the stray dogs of Sochi via my twitter stream, when a sweet homeless Shepherd (https://twitter NULL.com/mattgutmanABC/status/431052207585501184/photo/1)-mix was posted by ABC journalist Matt Gutman. Several days later, U.S. skier Gus Kenworthy posted a photo of the litter (https://twitter NULL.com/guskenworthy/status/433317626878885888/photo/1) he plans to adopt. 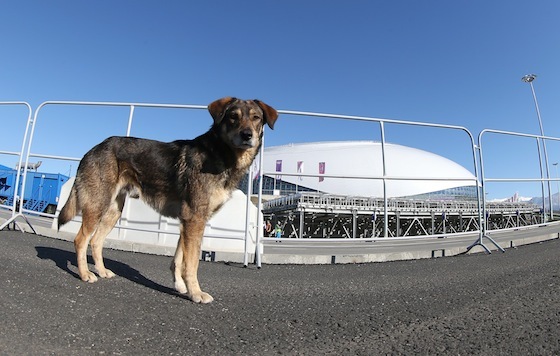 Sochi, the world learned, had a dog problem, and had contracted with sharpshooter exterminators to make sure the vermin wouldn’t be an embarrassment during the Olympics. Amid the oddities and malfunctions in the lead-up to the opening ceremonies (yellow hotel water, and bobsledder Johnny Quinn having to break down his hotel’s bathroom door (https://twitter NULL.com/JohnnyQuinnUSA/status/432080704776962048/photo/1)), the strays of Sochi became big news, fast. This was no fun and games. Until a local billionaire stepped in with funds for a shelter complex, thousands of strays were targeted for death. More evidence, it seemed, of Russia’s authoritarian response to virtually everything — from building contracts and overspending to censorship and human rights. The dog shootings were eerily timely for me because they paralleled research for my second novel, set in 1980s USSR. In the aftermath of the Chernobyl/Pripyat evacuation, I learned, clean-up crews called “liquidators” went in to shoot the house pets that had to be left behind. The idea was to catch them before they could wander, radioactive, through the buffer zone toward other villages. Cats were wary and hard to shoot, according to interviews in Voices From Chernobyl (http://www NULL.npr NULL.org/templates/story/story NULL.php?storyId=5355810). But dogs were easy targets, as they naturally approached people in search of food and affection. It’s been awful research, but riveting. So much of the tragedy was caused by the government’s delay in helping its people — a mind-boggling 36 hours passed before an official explanation, and then finally evacuation from under the radioactive cloud. The Soviet Union was loathe to admit incompetence on the world stage or create panic in its citizens, and wanted to take care of things quietly, superficially. So, families picnicked in the contaminated grass while their government kept up appearances. But long before that, the disaster was was set in motion when inferior materials were purchased to build the reactor, in inadequate supply. Then in the rush to make deadlines, the reactor opened before all its safety tests had been done. So proud the Russians were, done on schedule. So good they looked internationally, all that complicated construction finished and facilities humming. I visited the USSR in 1989 as part of an Intourist group — the primary way to visit then, officially chaperoned by the government in its bugged hotels. And what we saw were elaborate facades hiding chaos, corruption and deprivation. We ate in restaurants that no longer bothered with menus, because they were 86 not just certain ingredients, but entire food groups. One of our scheduled side-trips flew us to war-torn Uzbekistan instead of Kiev because lo, there was a cease fire in the civil war, and that’s where Intourist wanted us to spend our hard currency. We drank champagne for breakfast, because the shipment of fruit juice hadn’t come in from Cuba. We ignored the broken hotel smoke detectors, clearly dismantled and rigged instead to bug the rooms. (http://beyondthemargins NULL.com/btm/wp-content/uploads/2014/02/RingsFail NULL.jpg)When you care above all else to contain the impression of chaos, chaos has a way of catching up. Sometimes it’s a missing doorknob and an oddly constructed toilet, a snowflake that doesn’t blossom into a ring. But sometimes it’s a lot worse. I found myself squirming as I watched the Olympic opening ceremonies, physically uncomfortable as the camera panned the enormous new stadium. It seemed unnervingly ambitious for contractors who had also produced the likes of a bathroom with two toilets in a single stall. There were high wires, and elaborate soaring props. A young girl suspended Peter Pan-style in the air. Pyrotechnics everywhere. The margin for error felt very, very slim. 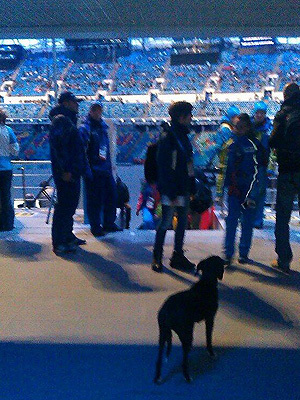 Then a photo of a stealthy stray appeared on my Twitter feed, a dog inside the stadium standing on a loge balcony, hanging out and watching the spectacle along with the rest of the spectators. It was a nice spark of levity and defiance in an atmosphere of discipline and obedience. But when it comes to Russia, I’m leery of sparks. This entry was posted in On the World and tagged Chernobyl, Gus Kenworthy, Matt Gutman, Olympics, Sochi, Sochi strays, stray dogs, Voices From Chernobyl. Bookmark the permalink. Loved your book, by the way!